Bellamy Blake looking on in concern at something in the distance. 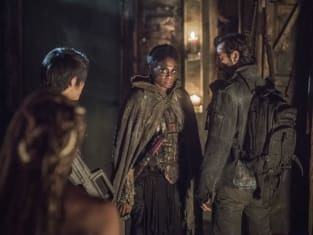 The 100 Season 4 Episode 8: "God Complex"
Raven: Yeah, but are we? Permalink: Yeah, but are we? Bellamy: Jasper, it's not safe out there. Jasper: What else is new?